This is not a sponsored post. Breville never reached out to me and sent me anything, not even a cup of flour to make the dough. No, this is just pure, natural, organic love of a product I bought with my hard earned money. It’s a pizza maker that has changed my experience with at home pizza making. I tried pizza stones in the oven and even grilled pizzas. They’re all okay, but nothing has been as revolutionary as the Breville Pizza Maker I bought at Williams-Sonoma this year. Yes a pizza oven installed in my backyard would be a more amazing way to make pizza at home, but as one fellow cooking classmate put at a recent cooking course, her husband had made two pizza thus far at a cost of $2,000+ per pizza. That’s what is most amazing about the Breville it is only $150, and I paid for mine with American Express points! You can now buy it in red too. Basically it replicates pizza brick oven cooking by heating a stone to 660 degrees. Sure it’s not the same as a real brick oven, but the results are pretty amazing. The trick is getting the pizza dough the right thickness. I like to have it around a 1/4″ thick so it isn’t too thin, the pizza rips and you get a huge mess when that happens. I have found Mario Batali’s basic Pizza Dough recipe to be a perfect solution. It will make enough dough for 3 10-12″ pizzas. I make one for our boys to split. Then one for my wife, tonight she had bell pepper and pineapple. Finally, I make one for me. Tonight I cooked some Niman Ranch Bacon and crumbled that with some fresh ricotta and black olives. The only bad part is I need three of these to make all the pizzas at once so we can all eat together. Good thing though is each pizza only takes 5-7 minutes to bake so they are quick. All in all, it’s been a great purchase and one I highly recommend if you are struggling to make a great pizza at home. Now you can for only $150 or for free with a bunch of American Express points. When I read this week’s SundaySupper theme was “Low & Slow” I knew exactly what I wanted to make and where I would get inspiration from. As regular readers of my blog will know, this site has been taken over by a lot of slow cooking – cooking in a smoker to be exact. After returning from South by Southwest in Austin last March, I had a constant craving for barbecue. Smoked barbecue was constantly on my mind since I had my first and so far only taste of the most amazing brisket I’ve had in my life at Franklin Barbecue. A coworker and I went to Franklin’s pretty late which was quite risky since the line is usually 3 hours and when they run out that’s it. No more and that time today was right around 1:15pm when we showed up and got behind a few people waiting outside the door. About three minutes after getting in line someone from the restaurant comes out to put a “sold out today” sign on the door telling us they’re out, but they may have some scraps. At this point, we are good with scraps. We waited in line with about 6 other people and when we finally made it to the counter there was one last perfectly cooked brisket just for us. No scraps! Instead we had some amazing brisket that day. I still can’t get that meal out of my mind (or is it taste-buds?) It was an unforgetable food experience similar to the first time I went to Mario Batali’s Babbo Restaurant in New York City back in the early 2000’s. That meal change my perspective on Italian food forever. Franklin Barbecue changed my perspective on Southern barbecue forever and I knew I had to find a way to make that experience come home, just like how I learned to cook a few dishes like Batali’s Mint Love Letters ravioli. For the next month I research smokers. Wood smokers. Ceramic smokers. Electric smokers. All kinds of options and read a ton of articles and message boards talking about perfect brisket and what it takes to get that great dark, Texas crunch and smoked flavor I had in Austin. When it came down to a final decision between a CookShack electric smoker and a ceramic Big Green Egg smoker, I went electric. Now I knew this sacrificed me ever fully replicating Franklin Barbecue, but I knew I could get close. Heck I’d probably only just get close and that would still be pretty amazing. So here I am on my second attempt at brisket in my CookShack smoker. The first attempt was great, but it was a little too complex in the steps and came out a little too dry. Plus last time I made a rookie mistake when buying the meat and bought what’s called a “flat” brisket. What you really want is a “point” brisket. The point is that extra flap of the beef shoulder that most butchers cut-off from the brisket. Fortunately, I’ve found a great local butcher who specializes in grass-fed beef and I called them last Tuesday, literally when the cow arrives, and asked for a point brisket that ended up being a little over 9 pounds. I also found Aaron Franklin, the owner of Franklin Barbecue, in some YouTube videos talking about how he cooks brisket. Here it is my second attempt. It was definitely an improvement, but I still have some work. Mostly I left too much fat on. Be sure to cut most of the fat off and watch Aaron’s video for some tips. I didn’t completely follow the instructions which I will next time. Basically, you want to remove most of the fat and keep some. Again, watch the video to learn more. Apricot-Mustard Baked Ham from Healthy.Delicious. Don’t forget to join the #SundaySupper chat on Twitter Sunday to discuss cooking low and slow! We’ll tweet throughout the day and share our delicious recipes. Our weekly chat starts at 7:00 pm EST. Follow the #SundaySupper hashtag, and remember to include it in your tweets to join in the chat. Check out our #SundaySupper Pinterest board for more delicious recipes and food photos. Trim the brisket removing most of the fat, but keeping some about a 1/4″ thick. Mix the rub ingredients together in a small bowl or shaker. Coat the brisket and let it refrigerate overnight. Heat smoker to 225 degrees. Place brisket in smoker. About 2 hours spray quickly with apple juice in a spray bottle. Remove brisket in 4 hours and wrap in butcher paper or aluminum foil. Spray apple juice and cover. Remove foil in last hour of cooking when meat temperature reaches 185 degrees. Spray with apple juice and place back in smoker until meat reaches 195 degree internal temperature. Mario’s Tagliatelle with Pancetta and Parsnips is a great recipe and one I’ve modified before. This version uses bacon and golden beets with a sage butter sauce. It also gave me an opportunity to break-in some new bowls I bought at the Ranch 99 Market last week after spending sometime in Torrance, California taking a Lexus LFA for a spin on the LA streets. Make your Fettuccine noodles using one recipe of basic pasta dough. Set aside pasta and start boiling some water with a dash of salt. Add bacon to a medium-high heat saute pan. Cook bacon and remove from pan when done. Leave the bacon grease in pan. Add the diced beets and cook for about 5 minutes turning often. Cook your pasta for about 2-3 minutes and drain from water. Add the bacon back to the saute pan and the 2 tablespoons of butter and sage. Cook for 1 minute then add the cooked pasta. Toss and serve immediately adding some Parmigiano-Reggiano to finish. If you are ever in New York City, I highly recommend Babbo. It’s an Italian restaurant from celebrity chef Mario Batali. It’s amazing. I say Mario is a “celebrity chef” but he is the real deal and is by far my favorite chef. His approach to Italian food that used to be featured in his Food TV Network show Molto Mario, back when Food TV had good shows instead of all of this competitive reality crap. My favorite two dishes of Babbo’s are the oxtail gnocchi and mint love letters. I’ve tried making both but have been more successful with my attempts at the latter than the former. Nothing I’ve made is equal or better to what I’ve had a Babbo’s. That said this is a very impressive dish and it is definitely worth your time and effort, especially considering how Babbo’s isn’t around the corner from my home. This dish took about a hour and half to make, so do it on a weekend, not after work. First thing you’ll want to do is make the Basic Red Sauce. I did this the day before.. The recipe is simple and uses these few ingredients. First start with making your pasta dough, I use a basic recipe that requires 30 minutes after the dough is made making sure it is not sticky and wrap it in plastic. Let it sit and make your filling. For the Mint Love Letters, ie the Ravioli, you’ll want to start with the filling. Blend peas, mint, Parmigiano Reggiano, heavy cream and salt and pepper using a food processor. I’d advise adding the heavy cream separately until you develop a thick paste that will hold as the filling in the pasta sheets. Now work with your pasta creating two sheets of similar size and shape that you’ll use to create about 3 to 4 raviolis. I run the pasta through the rollers starting at thickness 1 working down to thickness 5. You can go as low as 6, but you will have some rip. I recommend thinning the sheets to size 5 thickness. Prepare each ravioli using two thin sheets of pasta dough and small dollop of filing making sure it’s not too large as you don’t want it bursting later when boiling. Continue making your raviolis and dust with flour so they will not stick to each other. Also start heating your water to bring to a boil, lightly salt. Start your sauce by lightly browning your spicy ground lamb. If you do not like lamb, use ground beef and add a 1 teaspoon of each of basil and oregano and add a few flakes of dried red pepper. Add the pasta to the boiling water and cook for about 5 minutes, being careful not to overcook or undercook. While the ravioli is boiling and the meat is lightly browned, add the red sauce and about 5 chiffon leaves of fresh mint before serving. Cook the red sauce and meat for about 3 minutes. Add several raviolis to each plate and complete with the meat sauce. Sprinkle with Parmigiano Reggiano. Serve. Hello Ragu, Welcome to 2011. Dads can Cook! What an obnoxious play on stereotypes. Ragu, yes that company that makes jarred sauces, is using moms to promote their latest recipe campaign with a YouTube video that insults dads titled Dad Cooks Dinner: What is Dinnertime Like When Dad Cooks? So I obviously cook and can easily put a jarred spaghetti sauce like Ragu to shame in about 10 minutes with a few tomatoes, garlic, olive oil, carrots, and thyme. Out doing processed convenience food with fresh whole foods is easy, which is why most people should buy the ingredients and take the 10 minutes it takes to make a pasta sauce instead of reheating a jar of dehydrated onions, sugar and ‘cheese cultures’ into a saute pan (full ingredients here.) Plus the sauce has 7 grams of sugar? Why does it need sugar? Use shredded carrots and ripe tomatoes and there is no reason to add unnecessary ingredients. Food quality aside the more troubling thing here is the brand’s reliance on outdated stereotypes. The video features several moms who share how poor their husbands are at cooking and while I’m sure they are not personally talking about all men, it definitely comes across that way. Let’s flip the tables for a second. If a tablesaw manufacturer did a campaign like this featuring a bunch of men saying how idiotic women are with power-tools would that be effective and responsible marketing? I highly doubt it. Perhaps we'll all look back at how backwards 2011 was thanks to Ragu. So please Ragu give modern families a break. Your “idea” here might have been cute in Leave it to Beaver days but guess what a lot has changed and I know a lot of men who are the primary cooks at home. Also, I’m not going to tell you that I’m never going to buy your product because truth be told I never did or ever would. I prefer making pasta sauce from scratch that no jar, not even the one’s twice the cost of yours can compare with. Hat tip to C.C. Chapman who runs Digital Dads for sharing his thoughts about this video: Ragu Hates Dads. It wasn’t until I went along with a friend while visiting New York City several years ago that I really learned to appreciate the beauty of pasta. Mario Batali’s Babbo’s is a phenomenal restaurant and by miles the best Italian food I have ever had. There are just a few simple things to making amazing pasta dishes. For noodles, I recommend one of the gems of Southeastern Michigan – Ventimiglia Italian Foods in Sterling Heights. I make at least one trip there a month and you can stock up on fresh pasta and freeze it with still better results than any dry pasta purchase. If you can’t get to Ventimiglia, try making your own pasta. It really isn’t as hard as it looks. After about 2 or 3 times you will become a pro. I promise. 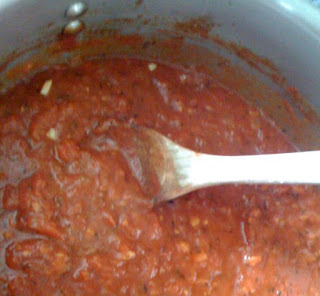 For the red sauce (photo above), I use Batali’s Basic Red Sauce recipe. The most important thing about this recipe is using the right canned whole peeled tomatoes. I highly recommend using ONLY Carmelina ‘e San Marzano. I make it according the recipe and freeze about 4 containers with enough sauce for making a pound of pasta. You can change up this sauce in a variety of ways. Here are a couple ideas: Add fresh ricotta and spinach. Add crumbled cooked italian sausage and 2 teaspoons of balsamic vinegar (and either blend in a food processor or not, either way is great.) Add mushrooms, fresh basil, and thinly sliced chicken breast. Or try your own modification. For the best sausage, I recommend Alcamo’s Market in Dearborn. They make some amazing sausages including classic Italian and some very interesting varieties like their parsley, wine and cheese sausage and an orange peel sausage. Finally, don’t over sauce. It is all about just having enough to coat the pasta, not drown it. This is my biggest issue with 95% of the Italian restaurants I have been to.